I was born in Taiwan but raised in Houston, Texas. With degrees in Engineering and Business Management , I came to Seattle as part of the high-tech boom and then discovered the joy of pottery during a break from the frenzy of the startup world. Throwing the elegant line, the graceful form is where I experience the greatest joy in creating my pottery, but it is the interplay of control and spontaneity that truly defines my work. I augment the tightly controlled lines of traditional Asian forms with textures and glaze effects that are much looser and sponteneous. 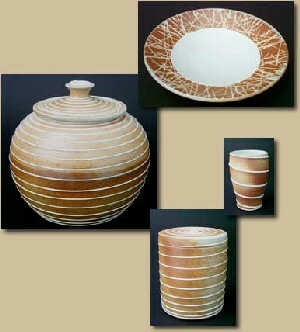 I make functional porcelain and stoneware pots for everyday and special occasion use. Most of my pieces are wheel-thrown and reduction-fired with assorted slip, glaze, and soda vapor effects. I generally use light, spring-time colors to complement the luxurious curves of my porcelain pieces. To emphasize the nobility of stoneware forms, I use darker, earthier colors in combination with the effects of soda vapor on the clay body itself. 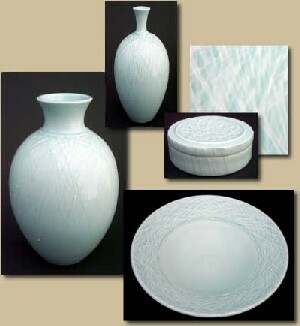 I often use light celadon glazes to emphasize and complement the purity and graceful lines of my porcelain pieces. 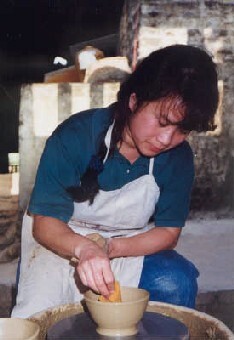 I like to fire my stoneware pieces in a soda kiln where the effects of the soda vapor causes the clay to flash and flux, revealing the noble character of the stoneware clay body itself. My goal is very simple - to create beautiful things that look good, feel good, and are useful in daily life. I try to make things that are appealing both from a functional as well as an aesthetic perspective. My greatest satisfaction comes from other people enjoying and using my pots as much as I enjoy making them. Copyright © 2001, Wheels Of Clay / Gene Miller.